single-sided, on plain, 8.5 x 11 white paper using either a laser or inkjet printer in black ink. Your previous U.S. passport was stolen. You must complete both the DS-11 and DS-64 (Statement Regarding Lost or Stolen Passport) forms. Original proof of US citizenship. Submit the original document, and make one photocopy. Birth certificate issued by a US city, county, or state – an original or certified “long form” certificate from the Office of Vital Statistics showing both parents’ names, with a raised seal. Hospital-issued birth certificates are not acceptable. You can acquire a certified birth certificate from the Office of Vital Statistics in your state of birth or order it at www.vitalchek.com. Consular Report of Birth Abroad or Certification of Birth issued by a US Consulate overseas. Original, signed US Naturalization Certificate. Previously issued, undamaged US Passport. Your original proof of citizenship will be returned with your new passport. US Passport Application Form DS-11. The application must be created online at http://pptform.state.gov. 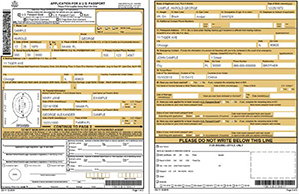 Print two copies of the DS-11 form. Do not sign the form until instructed to do so at the Passport Acceptance Facility. US Passport Form DS-64, “Statement Regarding a Lost or Stolen Passport,” will be created online along with your US Passport Application Form DS-11. One NEW passport-style color photograph. Photo must be on high-quality photo paper with a white background, taken within the last 6 months. Must be 2″x2″ with face measuring 1″ to 1 3/8″ from top of head to chin. Photos must be clearly different from photos in any previously issued passports. You must have a neutral expression with closed lips. Your eyes must be open. No glasses, uniforms, or hats are allowed, except for religious headgear. You must include a signed letter explaining that the item is worn daily for religious reasons. Proof of known or anticipated travel plans. A business letter (on company letterhead) stating that a passport is required for travel. This letter must be signed by a representative of the company other than the applicant with an original pen-to-paper signature and must specify the applicant’s departure date(s) and destination(s). A photocopy of the front and back of your state-issued driver’s license or identification card. The photocopy must be on 8.5″x11″ paper, on only one side of the paper; you may use two sheets of paper if necessary. If the name on the ID does not match the name on the proof of citizenship, submit an original name change document (i.e. marriage certificate or court order). Applicants who hold out-of-state identification or who are 16-17 years old should contact for additional identification requirements. $170.00 for a passport book only. $200.00 for a passport book and passport card. Two Letters of Authorization, emailed separately to you after consulting a travel specialist. The Letter of Authorization (LOA) allows us to represent you to all agencies involved in issuing your passport. The signature on all the LOAs must be an original pen-to-paper signature in blue or black ink, and must match the signature on your current passport and your application form. No faxes, scans or copies will be accepted. You must obtain the LOA from your travel specialist before you visit the Passport Acceptance Facility. You will need to appear in person at a Passport Acceptance Facility to have your identity verified and documents reviewed by an Acceptance Agent. A $35 execution fee will be paid directly to the facility. To find the most convenient Passport Acceptance Facility, visit http://iafdb.travel.state.gov/. ©2008 - 2019 Express Passport All rights reserved.